My wife, Claudia, is a retired teacher, and our Kiwanis Division's Young Children Priority One Chair. She loves books and she loves children. Claudia thought it would be a great idea, if we could make it possible for all the students in a Kindergarten class to receive a book of their very own. She approached our Kiwanis Club and they thought that a "First book program" would fit in with their "Serving the Children of the World" concept. We only had a limited amount of money so the club picked a kindergarten class in one of the smaller grade schools. This was a school where, on certain evenings; we had a monthly "Guest reader" read bedtime stories to the children. The children, along with their parents, would bring blankets and often wear pajamas as a member of our club read to them. As we read, we would act out the stories with sound and motion. "The Giant was Soooo big that when he walked you could hear him go thump, thump, THUMP!" You could hear the thumps as the children joined us in thumping their feet. Claudia had specific ideas on what sort of books she would give to the children. She wanted new high quality hardbound books that would be age appropriate. My wife asked a friend of hers, who was a buyer for Powell's Book Store chain if he could help her out. Her friend managed to obtain a number of publishers "Samples" and all at once Claudia had enough books to give out to the school children. Claudia approached the School Librarian and a time was set up to give the books out. The books were all set on a table and the children had the opportunity to chose a book of their very own. "I'm amazed," said the librarian. "I thought most of these children came from well to do families. I was really surprised to find that many of them have never had a book of their own." Later Claudia said to me: "I only wish that we could do this for all of the children in our school district,"
I responded with "Let's ask our Kiwanis club Board of Directors." We did just that. The club Directors loved the idea, but the reality was that the club didn't have enough money to supply books for all the Kindergarten classes in the entire school District. "I'm not going to let a lack of money stop me," said Claudia. "I would like the club's permission to do a fund raiser." She, of course, got permission and started raising money in earnest. Claudia's friend at Powell's arranged for her to again get some publisher "samples" of games, audio books, and various other gift items. She assembled gift baskets, and held various sales and auctions. She won over the support of the local Senior Center, as well as the School District. She also was able to get help from the Women of the Elks and the Saint Helens Daybreakers Kiwanis. With everyone's help, Claudia earned enough money to purchase books for all of the School District's Kindergarten students. The Children gathered, one class at a time and walked around a book filled table. 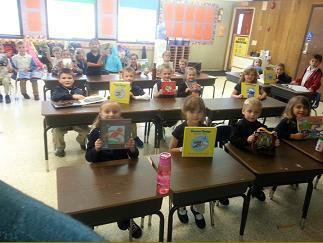 Each child picked up a book to take with them. "Is this book really for me?" Asked a little girl "…or do I have to leave it at school?" The teacher grinned "No, this is your book. You most certainly can take it home with you." This is now the second year of The Kiwanis Club of Saint Helens First book program. When asked if she plans to do it again, Claudia replied that she hopes to see this as an ongoing program. "We need to encourage literacy and a love of books at as early an age as possible." Claudia also has made sure that our Club includes books for small children as part of their annual Christmas basket program. Claudia loves books and she loves children and has found a way to combine her love of both.